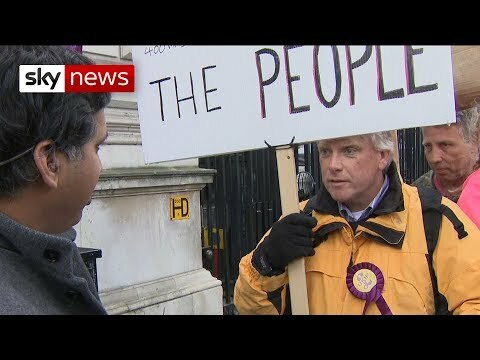 As discussions continue in Cabinet to solve the Brexit crisis, a protester wearing a UKIP badge shouts “treason” aimed at Theresa May during a live television interview. Sky News Politics Editor Faisal Islam calmly asks why he has chosen that form of language to describe the Prime Minister. Stupid Brits. Laughing stock of Europe. Brexit in leave with referendum in debate to the not in exchange by remain in vote to the British together relation in Union with England as Parliament to generation! His traitor aqusation is viable,so shut up and never mind the sky propoganda with left liberal Snowflakes agenda political argument……sky is fake news as are all the mainstream media…. Anyone who thinks May is a europhile is a bit lost. The witch isn't pro Europe or pro Brexit. She is pro power. Specifically her own. Then her corporate friends. Then her parties. She isn't a traitor because she isn't acting on behalf of any foreign country. She acts for big business and the City of London and her husband the chair of the board of G4S. Traitor or no traitor…this country is becoming a laughing stock with all these bipartisan extreme views on both sides! We are just in one big nightmare deadlock! What a totally obnoxious character. No, I'm not talking about the guy in the yellow jacket. Asif he actually tries to question why he is calling her treasonous, is That guy for real, seriously, 🤔 says it all sky news. Why does he think he is calling her That I think ino why does any one else? Only in the middle of a cultural war for freedom in the west, would sky imploy someone called ‘Faisal Islam’ and expect them to be impartial. What a joke we have become in the UK. Reporters are supposed to be Impartial. Faisal DESTROYS Brextremist with stone cold FACTS!!! What a dangerous precedent that news guy is setting. Questioning free speech. I despair at the MSM. The internet revolution has given us a taster of real information from every source, not just those cherry picked by Sky, the BBC and others. Please fight to keep our internet information available, otherwise we are at the mercy of these imbeciles. Channel 4 and Sky News are biased. Treason May always looks happy in Brussels wearing Blue and Gold but once back in Westminster her sour face drops! Sky News are as bad as Channel 4 News and the BBC. In other words a fake news organisation ramming liberal left crap down peoples throats. The real traitors are the Brextremists who want to sell the UK to the US. Funny. Sky reporter had balls. Here we see a member of the liberal metropolitan elite, so foreign that the word ‘Islam’ is his surname, abusing his platform on a supposedly impartial TV news channel to mock an ordinary working Briton who’s upset that the largest democratic mandate in British electoral history is being ignored. It is treason and he should not be attacked for saying so. The people have been betrayed and only an idiot like Mr Islam could fail to realise this!! Just shows how Sky feels about things. Havent seen them confront that retarded remain idiot who is outside Parliament every day wearing his Euro hat. Poor Faisal defending his puppet masters and that horrible Kay laughing as she is overpaid to lie on camera, disgusting degenerates. Faisal is obviously a remainer!. If he was a Brexiteer who Theresa May had stolen Brexit from, then he would see it totally differently!. Sky News is the reason why I have just cancelled my Sky subscription after many years. I am sick to death of their smug bias and I will not give a single penny to their cause. SKY NEWS BBC CHANNEL 4, THEY DONT LIKE THE MAN @ WOMEN. IN THE STREET HAVIN A VOICE WE WORKED FOR THIS COUNTRY,NOT HAVIN DINNERS ON A PLATE AS RHESE PARASITES IN PARLIMENT. Guy in the yellow jacket is a legend. Stopped watching sky news, now l know what they are all about. Sky – what a joke ! Sky have been presenting such twisted fake news to the public for years and Mr Islam has the cheek (and fails by the way) to question and attempt to humiliate a member of the public because of his views !!!!! A pity the fellow was a rather inarticulate twit who couldn't express how there has been a damned referendum, the people have spoken (to coin a phrase…), and so this anti-brexit effort, from wherever it may or may not actually be, is certainly in direct conflict with the wishes of a significant majority of the voting public of the United (!) Kingdom. May will probably join Merkel as one of the two most hated premiers of the century if not of all time, but hey! The century is still young, so there is plenty of opportunity for someone else to do even worse. Well…how about something to help lower your spirits?! Just wait a day or two ; something is bound to turn up…! Sky one sided, biased fake news. Wel said Faisal Islam. People think that they can shout out everything that comes up in there mind. If we all would do that we will get anarchy. The reporter is overreacting.. give some respect to public, it's democracy where everyone is entitled to free speech/expression.